Former FBI Director James Comey donated the maximum legal amount to Democratic US House candidate Jennifer Wexton. Comey has typically donated to Republicans, including the presidential campaigns for Mitt Romney and John McCain. WASHINGTON – Former FBI Director James Comey has broken his streak of donating to Republicans, giving the maximum legal amount to one of the most competitive House races in the country. According to Federal Election Commission filings, Comey gave $US2,700 in September to Jennifer Wexton’s campaign to unseat incumbent Republican Rep. Barbara Comstock in Virginia’s 10th congressional district. Comey, whom President Donald Trump fired early into his presidency, has traditionally donated to Republican candidates. He donated to Mitt Romney’s presidential campaign in 2012 and John McCain’s in 2008, as did his wife, Patrice Comey. 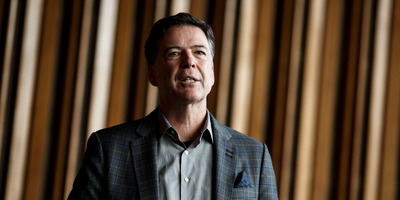 Comey revealed during a congressional hearing in 2016 that he was no longer a registered member of the GOP, but had been for most of his adult life. During his book tour earlier this year, Comey said the Republican Party did not reflect his values anymore.